There's only one question that really matters in the general election campaign now beginning in Ireland. It's the €85 billion question -- the question of what the various political parties here will do about the €85 billion bailout fund put together by the International Monetary Fund (IMF) and the EU to stop Ireland going bust and accepted by the outgoing government. Fianna Fail says it's the best deal that was available. Fine Gael and Labor say it's a poor deal and must be renegotiated. Sinn Fein says it's such a bad deal we should tell the IMF and the EU to take their billions back. And the Green Party ... well, who cares what the Greens think any more. The €85 billion question is the only one that matters because it dwarfs everything else. It makes all the other issues here look completely insignificant. More than that, it determines everything else. Everything a government does costs money, and without those billions any government here in the next few years would be unable to do anything beyond the very basics. There's no doubt that we need the money. Thanks to the collapse in tax revenue, the gap between Irish government spending and revenue -- the deficit -- is huge. Last year it was around €19 billion (we spent around €50 billion and got in just over €30 billion). This year, even with the severe cutbacks already announced, the deficit is going to be only a few billion less than that, partly due to the interest payments on our growing debt mountain. It's going to take several years of very painful cutbacks to begin to get our budgets close to being balanced again. And in the meantime we need the bailout money to keep going, to enable the government to pay the police, keep schools and hospitals functioning properly, pay welfare to the half a million people out work and so on. The alternative would be an implosion of the Irish state, social unrest, possible riots on the streets. Even if we manage to stick to the plan agreed with the IMF and EU, the deficits over the next three years plus the cost of state bonds that will mature in that time period will come to around €65 billion. So that takes care of most of the €85 billion bailout fund. The other €20 billion, of course, will be used to keep our reorganized banking system afloat ... we hope. The interesting point about this is that most of the €85 billion bailout fund will not be going to the banks, as many outraged people here seem to think. It will be going to keep the lame duck Irish state going over the next three years. So yes, we do need the money. We need it badly and we have to take it. And since the markets won't lend to Ireland except at rates that don't make sense, the only place we can go for the money is the EU and the IMF. The question is not do we need an €85 billion fund. The question is whether the EU and the IMF are treating us fairly, and whether this particular deal is the right deal for us. Two weeks ago in this column I referred to the deal as the IMF/EU con job. I did so because, like a lot of people here, I am sick of listening to senior Eurocrats saying that the aim of the deal is to help Ireland, to rescue Ireland from going bankrupt. I did so because, like a growing number of people here, I believe that the real aim of the deal has little to do with rescuing Ireland. The real aim is to rescue the euro single currency and the major German, French and British banks who lent tens of billions to Irish banks during the property boom. The Irish state, as you know, has guaranteed all the deposits and liabilities of the Irish banks, effectively turning these billions in outstanding liabilities into debts of the Irish state. Were the Irish state to default the fallout in Europe and the effect on the euro would be severe, possibly catastrophic. And that is why the IMF and the EU made the provision of the €85 billion bailout fund for Ireland conditional on the Irish state sticking with this arrangement. 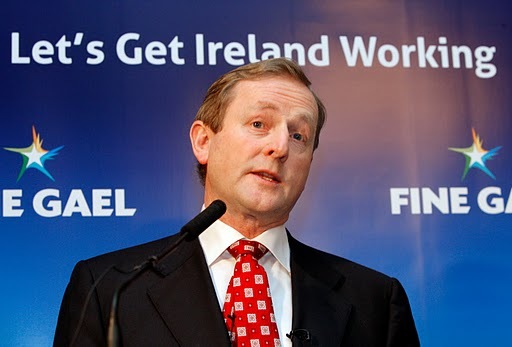 Bondholders and European banks were not to be burned by Ireland, if we were to get the money. The outgoing government, as we know, accepted the deal on this basis. And so did most people here without thinking about it too much. It was humiliating, but we needed the money to avoid slumping to Eastern Europe living standards. So we swallowed our pride and took the deal. That was in December. Since then, however, particularly in the last two weeks, the severe hike in taxes which is part of the economic plan has made many people here stop and think. Faced with real cuts in their pay and living standards, they have woken up and begun to ask questions about this "rescue" package. They have begun to ask the same question we asked on this page two weeks ago. During the boom, the European banks loaned billions of euros to the Irish banks, which then lent it on to Irish property developers who inflated the property bubble here. The European banks did so because they were getting a higher than average return on their funds. They, like so many people here, wanted a bit of the Irish property boom. But since they took the risk, surely they should now be sharing in at least some of the consequences of the downturn? After all, that's how capitalism works. You take a risk for high rewards. If it goes wrong you lose some of your investment, maybe even all of your investment. Except that's not what is happening in this case. In this case the European banks are to get ALL of their money back, courtesy of the state guarantee to the Irish banks. A chunk of the EU/IMF bailout fund for Ireland will be used to pay back the European banks in full. Unfortunately the €85 billion IMF/EU fund is not a present for us. It's a loan which has to be paid back with interest. And who is paying this? The ordinary Irish taxpayers, that's who, even though the vast majority of them had nothing to do with the property bubble here. This point was made in the European Parliament recently by the Socialist Member of Parliament Joe Higgins from Dublin. The European Commission President Jose Manuel Barroso erupted in fury at the accusation, which shows that Higgins was right on the money. It's worth going on line to see the Higgins speech and Barroso's angry reaction (Google either of their names and you will find it). Higgins described the bailout fund as “nothing more than another tool to cushion major European banks from the consequences of their reckless speculation...” He said it was a way of transferring tens of billions of euros of private bad debts on to the Irish people. “Far from being a bail-out, your IMF/EU intervention in Ireland is a mechanism to make vassals of Irish taxpayers to the European banks,” Higgins said. “You are destroying our services and the living standards of our people." Spoken like a true socialist, especially the reference to vassals! It was great stuff and almost turned us all back into the student socialists we used to be all those years ago. Of course it's not that simple. But Higgins has a point, and it's a point that most people here agree with. And it's not just ordinary people who are asking the €85 billion euro question. Some economists here are now asking why the European Central Bank (ECB) did not see what was going on during the Irish boom. They are supposed to be in charge of banking in the EU and they get all the figures sent to them by the national central banks (including the Irish Central Bank) so they cannot say they did not know. Why did the ECB not see that the Irish boom was being driven by a huge property bubble? Why did they not stop the French and German banks from pouring money in here to fuel the boom? That's what the ECB is supposed to do. Like everyone else they missed it. In that way the mandarins in the ECB are almost as culpable as the failed regulators and crazy bankers here. Instead of apologizing for their mistake, however, they are lecturing Ireland about our failure of regulation, about irresponsibility. And they are teaching us bad boys and girls a lesson by lending us the billions of bailout money at a crippling 5.8%, even though they are raising the funds at less than 3%. And they are doing that even though a chunk of the money will be used to pay back the European banks! You couldn't make it up! With friends like that, we need no enemies. The Fine Gael leader Enda Kenny and his finance spokesman Michael Noonan made a trip last week to Europe to visit Barroso for discussions on a possible future renegotiation of the terms of the Irish bailout deal. Or so we were told. In fact it was no more than a photo op for Kenny to make him look like the taoiseach (prime minister) in waiting as the election campaign here gets underway. But it's hard to have much confidence in Kenny renegotiating anything. He is so out of his depth on the big financial question that the Fine Gael party has been keeping him away from the media as the campaign begins. That renegotiation has to be the biggest issue in this election because everything else will depend on it. Without it, all the promises that the parties will make between now and voting day will be meaningless because there will be no money to do anything. So the €85 billion euro question is -- does any Irish politician have the brains and the backbone to stand up to Europe and get us a fair deal?